This task shows you how to setup and use the Istio Dashboard to monitor mesh traffic. As part of this task, you will install the Grafana Istio addon and use the web-based interface for viewing service mesh traffic data. To view Istio metrics in a graphical dashboard install the Grafana add-on. Verify that the service is running in your cluster. 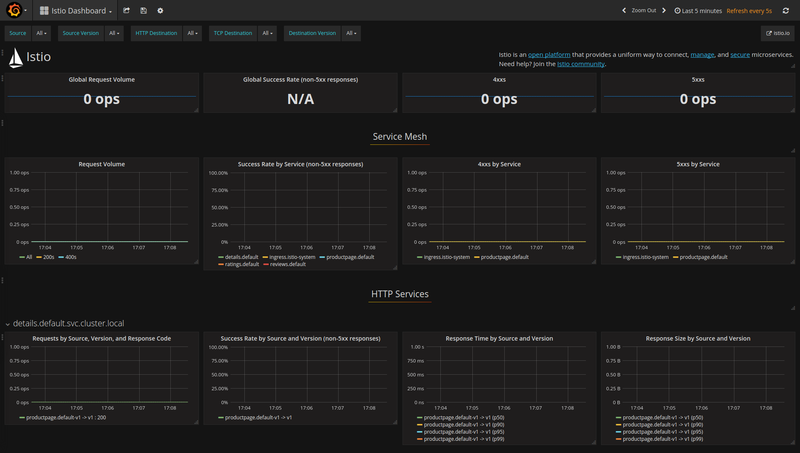 Open the Istio Dashboard via the Grafana UI. Visit http://localhost:3000/dashboard/db/istio-dashboard in your web browser. Refresh the page a few times (or send the command a few times) to generate a small amount of traffic. $GATEWAY_URL is the value set in the Bookinfo guide. 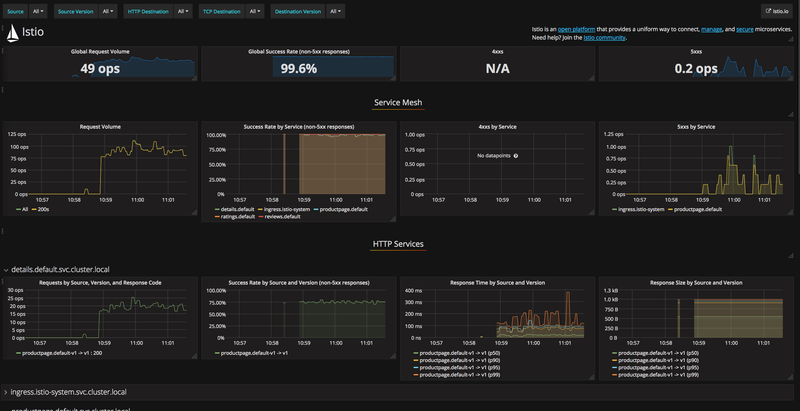 The Grafana add-on is a preconfigured instance of Grafana. The base image (grafana/grafana:4.1.2) has been modified to start with both a Prometheus data source and the Istio Dashboard installed. The base install files for Istio, and Mixer in particular, ship with a default configuration of global (used for every service) metrics. The Istio Dashboard is built to be used in conjunction with the default Istio metrics configuration and a Prometheus backend. The Istio Dashboard consists of three main sections: 1. A Global Summary View. This section provides high-level summary of HTTP requests flowing through the service mesh. 1. A Mesh Summary View. This section provides slightly more detail than the Global Summary View, allowing per-service filtering and selection. 1. Individual Services View. This section provides metrics about requests and responses for each individual service within the mesh (HTTP and TCP). For more on how to create, configure, and edit dashboards, please see the Grafana documentation.